DO THIS: Contemplate the impermanence of things (exercise). Okay. Okay. Enough quotes. It is better to really experience a concept than just read it. So I have been making up practical exercises to remind myself of these truisms (exercises are very stoic). Here is the one i developed today to remind myself that none of the things in my life are actually “mine”. I do this about once a quarter. It will take you 10 minutes. Do it right now! The impermanence of things exercise. 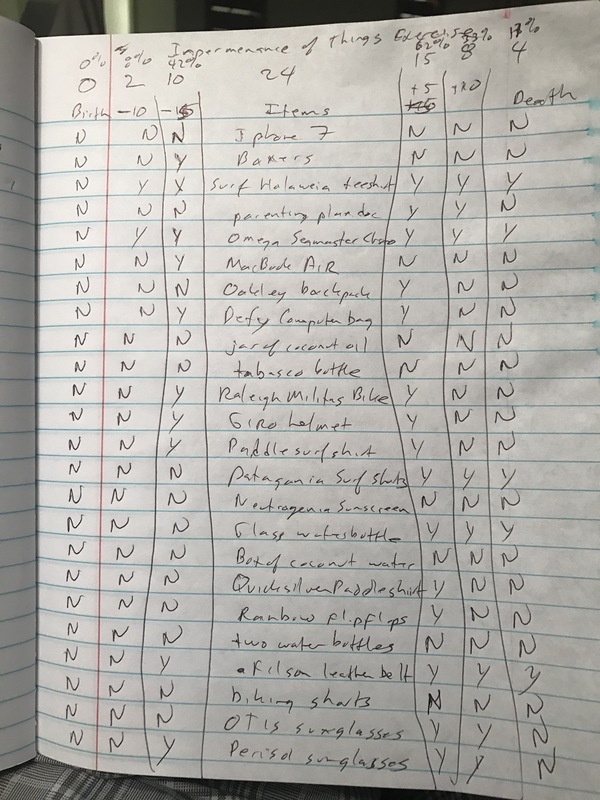 On a rulled sheet of paper write “things” in the center at the top of the page. To the left write -5, -10, and Birth. To the right write +5, +10, and Death. Make columns for each with the middle one under “things” the widest. Now look around where you are and start writing down the middle column all the things that are “yours” that you see. Fill the page, should be just over 20 or so. Now down the left columns for each thing put a “Y” in the -5 box if it was in your life five years ago, or ten years a go or at your birth. Do this for all the things. Then go down the right side columns and predict if this thing is going to be in your life five years from now +5, ten years and at your Death. You get the idea. Now count up the number of “Y” in each column and put it at the top along with what percentage it is of the total number of items. Here is one I did today in my hotel room in Honolulu. Of the 24 things on my list (and there were like over 100 things around the room) less than half (42%) were in my life 5 years ago, almost none (8%) were in my life 10 years ago and exactly zero were in my life at birth. Looking forward I was fairly optimistic that a majority (62%) would be in my life five years from now, exactly a third (33%) would be around in 10 years and 17 % would be with me at death. But then I will be dead and I can’t take them with me so they will be someone else’s at that time so 0% will go with me at Death. What did this exercise remind me of is a very visceral and visual way ? 1. Coming into this world I had nothing. 2. The majority of things around me are recent additions. 3. The things I believe will be with me at death have lots of experiential value to them (I have had meaningful experiences with them with other people to create memories additional to the thing itself). 4. Most of the things I see are temporary objects in my life (were not here 5 years ago and will not be here 5 years from now). 5. While some things may be with me at death I can’t take any of it with me so the things really are not “mine”. Side note: I have an absurd number of things with me on vacation. And multiples of things. Seven paddle shirts. Three surf shorts. The experiential value of a thing is inversely related to the number of them I have. For example I have only one watch with me (while I own many). The one watch i wear the most often has the most experiential value. Is the one I see myself with at death. So the obvious question is “do in need all those other watches?” This exercise made me contemplate that question. While I don’t have an answer it is a good thought exercise and moves my thought in the right direction (which is to keep asking the questions). Things don’t make a life. Meaning comes from experiences with other people. I was born with nothing and will die with nothing. I designed this exercise myself so it is not based on any academic or scientific study. There has been a lot of research around attachment theory which sometimes includes “stuff” but mostly is focused on relationships. How interest in science has been fueled by attachment to “things” but that is fading. A little off topic, but interesting idea. Sounds like a good exercise to do and I’m definitely recognizing how much I value the different experiences I have with people. Thanks for sharing this exercise! Previous Previous post: Why am I blogging again?